This Belgian style beer has a light golden color but do not let that fool you, with an 8.10% alcohol content it packs a kick. 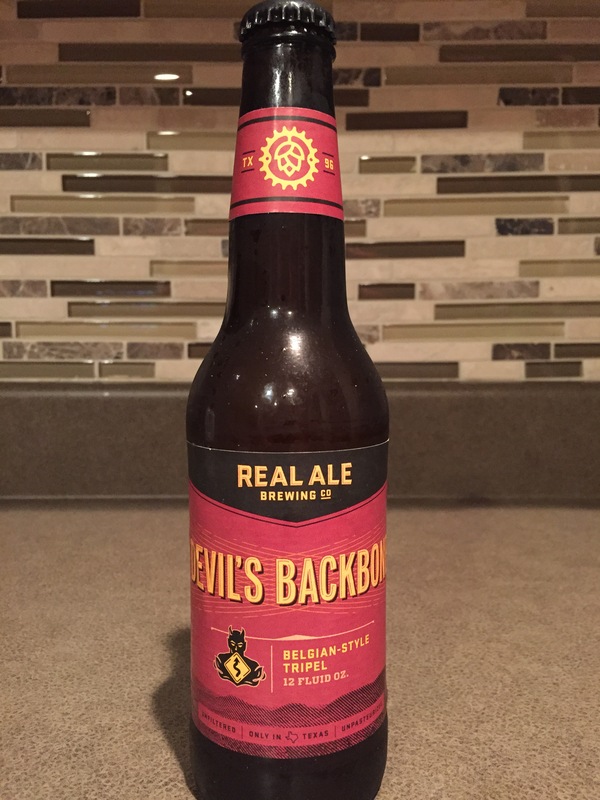 This ale uses spicy hops and Belgian yeast to create and distinct and unique aroma and taste. Despite the alcohol content this beer is not heavy. Real Ale is obviously dedicated to their craft and get some pretty decent results. Devil’s Backbone is a good introduction to the style; it manages to be unique enough to get your attention, but not so out in left field that it put people off. It’s definitely ale and seems like it’s for real. Appearance is a nice, mellow pale golden color. Murky since it’s unfiltered, but seems to have fairly good carbonation. Good 2 finger head that doesn’t stick around extremely long. Has moderate lacing. Reminds me of a hefeweizen or witbier. Smell is fruity with a good split of hop floral notes and esters like banana and nice resinous wood. Taste is first a good wallop of spice and herbal notes like pepper and cloves and an undertone of citrusy hops. Mixed with light alcohol astringency and it makes a solid bite. Then the fruity flavors come through with another bite of spice, followed by sweetness and malty grain. Mouthfeel is warm and a little sticky, but also very smooth and crisp.